Our CEO Ken Naismith shared his views on the benefits of employee ownership with a packed audience of business people at an event in Edinburgh last week. The employee ownership workshop organised by Co-operative Development Scotland (CDS) was attended by business leaders from sectors ranging from architecture to care services. They were all interested in finding out about how employee ownership could potentially benefit their business. Computer Application Services (CAS) became employee owned in January 2014, shortly after Ken, pictured, took over as Chief Executive. He explained to the audience how employee ownership had offered an exit route to CAS’s previous management who were looking to retire, while giving employees an opportunity to develop and own a slice of the business. That slice could be bigger still when Ken and chairman, Ian Ritchie themselves exit the business in due course. CAS is now poised to apply for investment to accelerate growth and reach out to new markets. “Doing this talk for other businesses considering Employee Ownership proved to be a great exercise in taking stock of how far team CAS has come, and where we are heading,” says Ken. Glen Dott, specialist adviser from CDS, reminded the audience that employee-owned businesses now account for £30bn of UK GDP, equal in size to the agricultural industry. He emphasised that employee-owned businesses in the long term offer better return on investment (ROI), lower employee absence and higher productivity. Irma MacLachlan, senior business analyst at CAS, was one of the team who shared with the audience practical examples of what it means for employees to act as owners, comparing it to owning rather than renting a property: it is down to you to maintain and improve it but entirely worthwhile to do so. 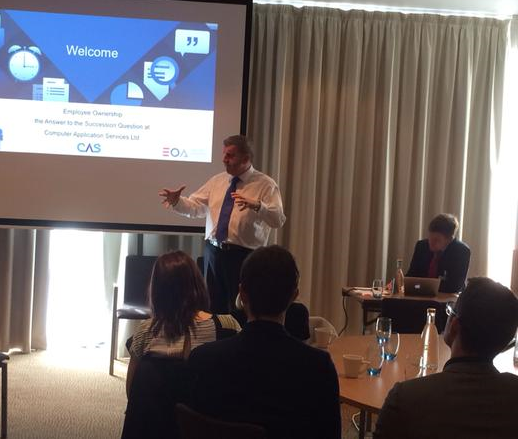 Find out more about the history of CAS and its journey to employee ownership.